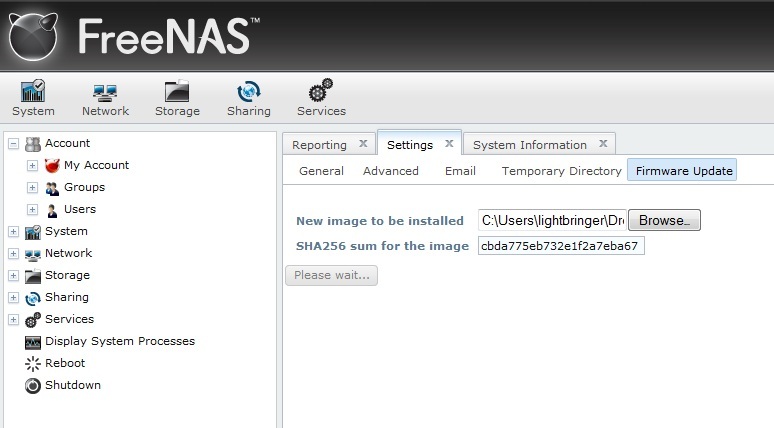 Back in February not long after FreeNAS 8 RC1 was released I wrote a blog about how to set up FreeNAS. 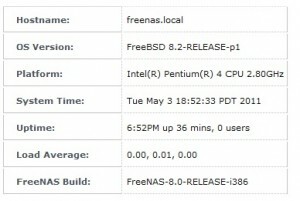 After several release candidates FreeNAS 8 was finally released yesterday so I decided I would go ahead and upgrade from RC1 to the release version of 8.0. After downloading the update file I logged into the web interface and proceeded to upgrade the firmware. In the web GUI the firmware update feature can be accessed by clicking on the firmware update tab on the settings page. After uploading the firmware image and entering the hash I clicked on upgrade and the button text changed to “Please wait…”. I hate waiting without a progress bar so I decided to leave it alone and work on something else while the update ran its course. About 10 minutes later I went back to check on it and nothing had changed, it was still stuck on the same screen. I decided that it would be a good idea to reboot it and try again. On this attempt I kept an eye on the console to make sure I wasn’t missing an error message that might provide a clue to the update failure, yet nothing was logged. After that test failed I came to the conclusion that the GUI update feature in FreeNAS-8.0-RC1-i386 must be broken. I decided I had two options, #1 burn a CD and reinstall FreeNAS from scratch, or #2 try to do the update manually. Since I was too lazy to burn a CD I decided to go with option #2. After some googling and testing I found out that you can manually update the firmware on FreeNAS. To complete the update you’ll need to reboot FreeNAS either through the GUI or using the command line (shutdown -r now). After FreeNAS starts back up you can verify if the update applied successfully. How big is your NAS? Right now it only has 1TB of storage. Which is not much compared to your mega array! How much capacity are you up to in that thing? I’m sitting at 6TB right now. I’m going to install 4TB more next week. Blu-rays take up 40Gb per movie, we have 64 of them so far. Nice! I’ll have to check out your blu-ray collection sometime. You inspired me to see if i could get FreeNAS running on VirtualBox. I was able to get it going and it seems to work well, check out my post about it. Me too had a 1Tb loaded to my prehistoric box which currently upgraded to Intel D425KT mainboard Atom based processor and 4gb DDR1333 RAM. Planning to upgrade it later on with 2x2Tb drive. Will check out FreeNAS 8 (amd64) in few months, I still have seconds of going back to FreeNAS 7 if im forcibly to use features like web server, rsync, & transmission torrent. Nice tip! The GUI update always seems to do absolutely nothing but this method only took a couple of minutes and it worked for me leaving the update image on the ZFS volume I have. Cheers! Thank you so much for this tutorial. Just used it to upgrade to 8.2.0 and worked just as described. Prior to this I was upgrading by burning CDs. The UI upgrade path has never worked for me, this procedure should really be in the wiki. I might have to try this method. I upgraded a system last week from 8.2.release to 8.3 via the GUI and it worked perfectly. Today I tried updating another system and it has failed. The system is remote and has no console, so I can’t get to it. Before I upgraded, I stopped my services (CIFS, NFS, SMARTD, SSH) as I recall the instructions told me to do in the past (although I did not do that on the system I upgraded last week). The firmware upload finished, and I got a dialog saying the system would reboot – but it did not. I started a shell and looked in /var/log/messages and there was an error telling me that since smartd was not started the system would not restart. So I turned back on the services I turned off, and selected a manual reboot. The system must have powered down because I can no longer ping – but it must have hung on restart. If I received a dialog saying the system would reboot, I suspect freenas did the dd and completed the upgrade. Is there any processing that it does on startup to complete the upgrade – or is this all done before the restart? I may be able to get someone onsite to power-cycle this machine, but I fear there will be bigger problems.